The first month of the 115th Congress saw a spike in protest disruptions inside congressional hearings or sessions, according to a review by the News4 I-Team. U.S. Capitol Police records show officers arrested at least 55 people for disrupting Congress in January -- almost a five-fold increase from all such arrests on Capitol Hill in 2016, when the congressional calendar was shorter and included lower-profile meetings and hearings. In an incident Monday, a protester was arrested for standing and speaking loudly inside the U.S. Senate chamber during a session, despite warnings to stop doing so by U.S. Capitol Police. 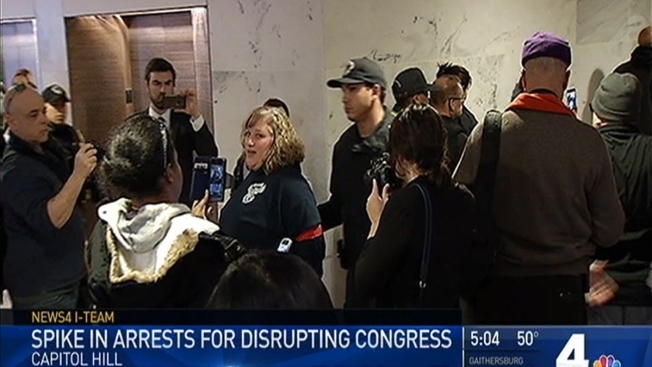 Police reports show multiple arrests for disruption of Congress Tuesday. At least two people were taken into custody by police for disrupting a Senate Judiciary Committee hearing in the Dirksen Senate Building. Later in the day, an NBC camera captured footage of a Capitol Police arrest of at least one protester near a U.S. Senate meeting on the nomination of Rep. Tom Price (R-Ga.) for the position of Health and Human Services secretary. A protester was processed at U.S. Capitol Police headquarters on D Street SE after being arrested for a disruption inside the confirmation hearing of U.S. Secretary of State Rex Tillerson at the U.S. Senate Foreign Relations Committee in the Dirksen Building. The criminal charge disruption of Congress is used against people suspected of protesting inside a meeting, session or gathering of Congress. The 55 arrests for disruption in January, though a marked increase from 2016, do not include arrests for other unlawful activities on U.S. Capitol grounds where members of Congress were not present. In 2016, police arrested nine people for disruption of congressional proceedings. In spring 2016, the agency arrested hundreds of people for unlawful protests outside the U.S. Capitol Building and out of range of members of Congress and formal proceedings. Law enforcement officials, who spoke with the News4 I-Team, said it is unsurprising 2016 would have fewer protest arrests on U.S. Capitol grounds. The 2016 legislative calendar was shorter than the schedule planned for 2017. Last year, which marked the final year of a presidential administration and the final year 114th Congress, included lower-profile proceedings than those held in January 2017. A U.S. Capitol Police spokesperson said the agency trains officers on how to handle protests that occur inside hearing rooms or chambers. The spokesperson said U.S. Capitol Police often communicate in advance with likely protesters to minimize the impact and risk of disruptions of Congressional proceedings.